It's a very busy time on our little farm, and part of the reason is because of potatoes! We have so many potato plants this year, and the little red spuds have just started busting up from the ground. Our little guy Manny has been curious about these round, delicious treasures for some time, so we decided it was appropriate to show him how to dig for potatoes. Since potato digging is hard and messy work, we gathered up some supplies to keep the mess outside (and not all over my walls and floors.) One thing I made sure to bring to the garden was a box of the Huggies® Cleansing® Wipes, which are great for getting that thick layer of dirt off of hands and from under fingernails before coming into the house for a full shower. The wipes remove 99 percent of germs and are just the thing for soft, sensitive skin. They are also fragrance free, alcohol free, paraben free, and are enriched with aloe and Vitamin E.
We also gathered up a basket for our potatoes, a small spade, and our sungear (hats and sunblock). Many people don't know this, but the potatoes grow directly under the plants. Some of the potatoes may have pushed their way to the top of the soil, but most of the larger potatoes will be in the ground below the roots. As you can see from the photo below, the potatoes will not all be of the same size, and this plant has some tiny potatoes just below the surface of the dirt. We will actually place this plant back into the ground and allow these tiny potatoes more time to grow. You can keep the plants in the ground well past the first freeze, although in very cold areas, you may have to cover the ground with straw to keep the potatoes close to the surface from freezing. Tiny baby potatoes not ready for harvest. As you brush away the dirt from the ground (or break it up with the spade), you'll see some larger potatoes ready to be harvested. It's perfectly OK to take just what you need for a meal or two, and leave the rest. 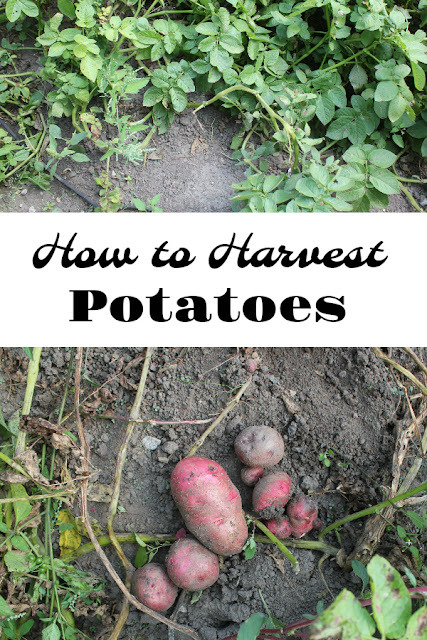 Potatoes lose their moisture quickly, and they are best when just taken from the garden. A few potatoes ready to be harvested. Potatoes tend to grow in clusters. If you decide to take one or two potatoes from a spot, you'll likely need to take ten. This is the part of the process that I encourage my little ones to help with. When I've found a treasure trove of easy-to-get-to spuds, we call the little ones over to dig them up! It's like a treasure hunt! Potatoes ready for the kids to dig! The potatoes Manny dug from the shallow soil near one plant. With dozens of potato plants, we could be digging for days. With the weather being nice, however, we'll just take what we need each day and leave the rest for later. Manny had a great time working with us in the garden. 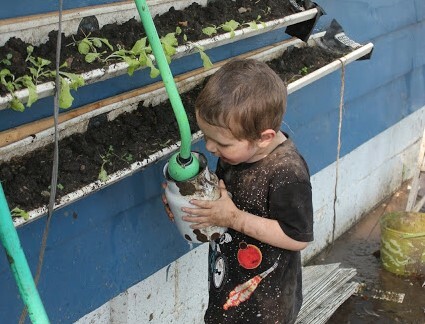 In addition to digging potatoes, he helped water lettuce! Clean up from the harvest was simple thanks to the Huggies® Cleansing® Wipes. Since we ordered from Sam's Club online, we were able to have them delivered to our door. And through September 17th, when you order any 2 Huggies products, you'll get $8 off your purchase automatically! I also really like to get Huggies items through the Sam's Club subscription service. It makes it easy to have my favorite staple items shipped to my door without having to remember to re-order. I definitely do not want to wait until I run out of something to think of ordering. This makes life so much easier. Have you ever dug potatoes? Will you let the little ones help this season? Potato digging is such good fun, and kids feel proud when they see food on the table that they harvested with their little bare hands!